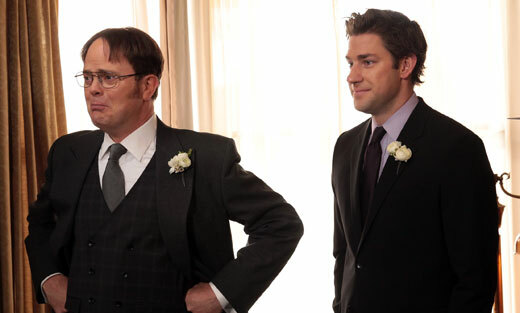 Scranton Swan Song: The Office Finale | pop mitzvah! I didn’t really have any feelings about The Office finale. Well, I don’t think it was better than last week’s episode. Let’s get that out of the way. The Dwight/Angela storyline came to a thrilling conclusion, and I didn’t know how badly I needed Darryl’s disco moves until they were actually happening. It was such a gently hilarious and fittingly poignant episode. Jim and Pam were cute too, but their utter whitebreadyness and poorly written conflicts have caused me to cool off on the Jam worship. So yeah, I was kinda expecting the finale to be even bigger and better – and while it wasn’t, it did offer some violent heartstring tugs and tearful moments. It hurt so good. Ohhhh yes. Pour that warm gooey nostalgia all over my face. Get some on my soul too. I won’t deny that the episode was uneven. There was no point in firing Kevin, and I don’t think anyone desired SO much of the Nard-Dog (even though he had a nice moment with a cheering crowd. RIDIDIDIDOOOOOO!). However, bearded Creed was genius. And my nightmare. Like I said, I honestly do not care about Jim and Pam anymore. It’s not a frustrated lack of passion, it’s just a resignation to what I guess was their inevitable conclusion. Pam was always boring, you guys. Jim was always simple. They were always going to end up as a nice, boring, simple couple. The difference is that nice/boring/simple was so much more romantic when they loved each other from afar. Marriage extinguished that spark so rapidly that the writers started to chip at their chemistry to make us invested again. It didn’t really work. They grew up, they got practical, and they got haircuts. And that’s okay. I’d rather them be together and boring than separate and complex. Although I stand by my idea: they should have separated and then both seen the documentary on TV, realizing independently that they were meant for each other. That little Tumblr fan video that Jim got the crew to make was such an eyeroll. So now Thursday nights are empty again. I can’t even go back to 30 Rock. What is this madness? But I loved something that Jenna Fischer said in the retrospective, about seeing Roseanne or Seinfeld on reruns. They’re timeless and still funny, despite being soaked in 1990s. And so it’ll be with The Office. Turn it on, and the magic’s back. Pingback: Hello, Ladies: Season One | pop mitzvah!